So are we and we have a great time. There are a couple dance floors....one for the really good dancers and another for the ones that aren't as good. 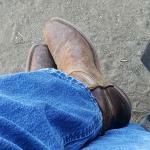 Get quick answers from Cowboy Country Saloon staff and past visitors.